I have had the bug to create some scrappy stars for quite some time. Since I had finished a few UFOs (unfinished objects), I felt like I earned the right to start another project...which may or may not become another UFO in the stack! I went online looking at all sorts of star blocks. I'm not really sure what I was thinking given my hatred for angles. I just love how they look finished! I found this block called Starry Path 2 and it looked right up my alley. I sort of disregarded the fact that it was a paper pieced block. How hard could it be, right? First, I would highly recommend to those that have never done paper piecing, read some directions. Which I didn't. I figured I would just cut all the pattern pieces out, cut the fabric 1/4" bigger than all the pieces, and sew them together in the right number order. In theory, that works. In reality, things just did.not.line.up.straight. At the end of the day my block would not lay flat. 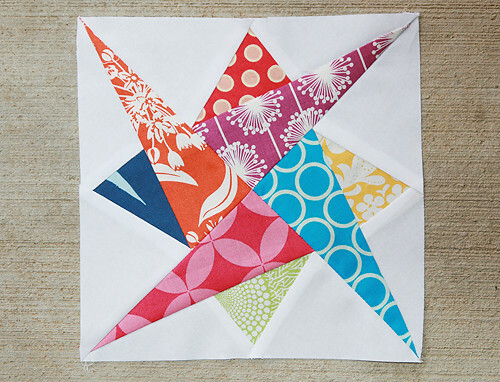 Any words of encouragement from paper piecing experts?